What's Beyond Forks? : Rogue's Pawn Tour! An interview with Jeffe Kennedy Plus an Excerpt! Rogue's Pawn Tour! An interview with Jeffe Kennedy Plus an Excerpt! I'm super excited about this tour! 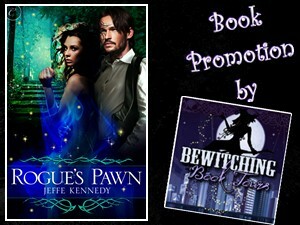 If you read my review of Rogue's Pawn, then you know it makes my day to have Jeffe Kennedy on the blog today! Since about 1996. I came to writing later in life, after I discovered a career in science wasn’t for me. But I started out as an essayist and writer of narrative nonfiction, so I’ve only been publishing fiction in the last 3-4 years. A dream. 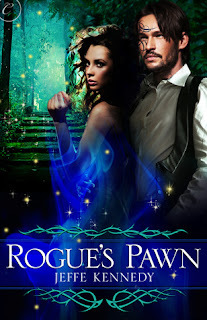 A lot of my stories come from dreams and Rogue’s Pawn was particularly that way. It was the first novel I wrote. I woke up on a rainy Saturday morning with the story in my head and sat and wrote on it for half the day. When you first started writing Rogue's Pawn, did you plan for it to be a series? I did—just because that initial idea for the story was so big. I wouldn’t have planned it that way, but I knew from the beginning that it would take a while to tell all of Gwynn’s journey. Oooh. I’m in the thick of writing it and it hasn’t been an easy book. Rogue and Gwynn take a lot of good steps to understand each other and then things happen. Gwynn ends up with a lot of responsibility on her shoulders. Starling is really growing as a person and confronting the reality of being a half-breed. Darling discovers his battle name at last! Definitely Gwynn. As much as I try to cultivate her to be her own person – and she has grown – she is still, in many ways, my avatar. She’s my most difficult character to write for that very reason. Nobody at all? Hmm. That’s a hard one. I’m kind of an open book. There are many things only my man or my mother knows. Or my cats—they see a lot that should never be mentioned. Dragonflight by Anne McCaffrey. The binding has come apart. To write every day, at the same time every day. I spent a lot of years resisting this advice. When I finally followed it, I became a writer. That I’m not the storyteller – that the story comes from outside of me. It’s a huge act of faith for me to sit down at the keyboard and trust that the story will come to me. Scary, too! I love to read – whenever I can. It’s even better if I can sit in the sun while reading. I also love to garden and take long walks. Phedre no Delaunay, because I want to know what it would be like to be her! “Enough,” a male voice said. As if I’d ceased to exist, Tinker Bell blinked her eyes and regained her lovely self, face smoothing, shining once again in sunny elegance. Reboot and resume program. She gracefully stood and glided to the tray, set the bowl precisely in the center, lifted the tray and left the room without hesitation. Booted footsteps crossed the room toward me. Act II, scene ii. Exit Nasty Tinker Bell, Enter God-Only-Knows-What-Now. My face was sticky with whatever the brothy stuff had been, my hair wet and fouled. I stank. I hurt. I was chained to a bed in a place so completely unknown I couldn’t begin to understand it. I tried to squeeze my legs closer together, but the chains seemed at the limit of their reach. The energy of my brief triumph evaporated, allowing tears to well up again. Oh, please, please, please, do not cry. The threatening sting worsened. I closed my eyes and one tear leaked out. He stopped next to me, surveying me. “You’re certainly a mess.” His wry voice was rich and smooth. My eyes snapped open to glare at him through the blur. Fifty different smart remarks flew across my tongue, most along the lines that any failures of appearance on my part could be laid on the doorstep of someone besides myself. But even the buzz of the first word on my vocal chords brought searing agony. Relieved to have a legitimate reason for the tears, I almost welcomed the searing sensation. I thought of the birds crashing in increasing cacophony with a small shudder. My stomach congealed in panic. Had he heard my secret thoughts? Don’t think of them, bury them deep, deep. Think of other things…like what? Think of home, think of Isabel. Isabel, my cat—Clive hated her. What would happen to her now? How could I not have thought of her until this moment? Abandoned, wondering why I never came home for her… And my mother—she’d be frantic. How long had I been gone? They could be all dead and buried, lost to me forever. The anguish racked me. “Shh.” The man sat on the side of my bed now, heavier than Nasty Tinker Bell. He brushed the hair back from my forehead, then placed his long fingers over my brow and, with his thumbs, rhythmically smoothed along my cheekbones, wiping away the tears that now flowed freely. I stifled a sob. I had cried more in the past day than I had in years. The sweeping along my cheekbones soothed me, melting warmth through my skull. The rhythm became part of my breathing. Deep breaths. Smooth, easy. The awful tightness in my chest gave a little sigh and released. “Let’s try again, shall we?” The man pulled his hands away. I could hear him brush them against his thighs. Soup, tears and blood. Yuck. My eyes cleared enough for me to see him. Ebony-blue climbed over half his face. The winding pattern of angular spirals and toothy spikes swirled out of his black hair on the left side of his face, placing sharp fingers along his cheekbone, jaw and brow. For a moment, the tattoo-like pattern dominated everything about him. Ferocious and alien. Once I adjusted, I could see past the lines. His face echoed Tinker Bell’s golden coloring. He could be her fraternal twin, with those same arched cheekbones. But where she was golden dawn, he was darkest night. Midnight-blue eyes, that deep blue just before all light was gone from the sky, when the stars have emerged, but you could see the black shadows of trees against the night. He shared Tinker Bell’s rose-petal mouth, but with a curious edge to it. I suppose a man’s mouth shouldn’t remind one of a flower, and there was nothing feminine about this man. Where she wore the pink sugar roses of debutantes and bridal showers, his lips made me think of the blooms of late summer, the sharp-ruffled dianthus, edges darkening to blood in the heat. His bone structure was broader than hers but still seemed somehow differently proportioned, his arms hanging a bit too long from shoulders not quite balanced to his height. Inky hair pulled back from his face fell in a tail down his back. One strand had escaped to fall over his shoulder and I could see a blue shimmer in its silk sheen. He arched his left eyebrow, blueness in the elegant arch, repeating the deep shades of the fanged lines around it. I stared at him. What was the question? Don't forget to check out my review of Rogue's Pawn! 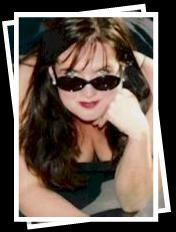 To learn more about Jeffe Kennedy and her books, visit her website.You can also find her on Facebook and Twitter. Thanks for hosting me - it was a fun interview!